On Wednesday my boss forwarded me an email inquiry from Ricky at an offshore drilling company. 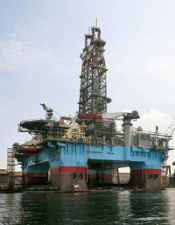 His team was working on a deepwater oil rig in the Gulf of Mexico. He asked us if we could help him build a portable filtration unit that could remove particulate down to 20 micron in size. After emailing Ricky directly, he went into more details, saying that he noticed a black residue that was accumulating in their tensioner fluid. The type of fluid that they were using was Houghton 273 CTF, a fire resistant non-explosive water-glycol fluid for compensator tensioners. 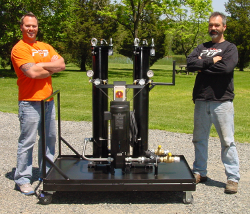 He emphasized that he wanted a heavy-duty skid-mounted mobile filter system for maximum flexibility and ease-of-use. His team managed 6 tensioners, each with a capacity of over 800 gallons, so they needed a solution quickly. After speaking with Ricky on the phone and following up by email, he sent me a detailed sketch that showed me the layout of what exactly he needed. I responded with a quote for his choice of a standard 5-GPM system or a standard 10-GPM system. He responded with additional customization requests: a pump motor with 230 Volts at 60 Hertz, the skid with 1.5″ male JIC fittings, and 4 hoses (two at 50-ft long and two at 25-ft long) with 1.5″ JIC female swivels. We constructed a custom skid-mounted portable filter unit and shipped it to the oil rig where Ricky was located. A few weeks after he received it, I followed up with a quick email. I was glad to receive feedback that the unit was working well and that they had already filtered the fluid in 5 of their tensioners. Ricky also reported that the black residue was no longer present, and the filters they were using were working properly. I’m glad that I was able to help them out! Do you have a question about mobile filtration systems or how to filter crude oil? Feel free to contact us anytime. Our friendly team of experts will be happy to help you out with your particular issue. We would be happy to see if we can help you out. Without knowing all the specifics of your application it’s difficult to determine which portable filtration system would be best in your situation. We’re thinking that a small custom bag filter housing would be applicable but we don’t want to provide a recommendation without knowing more details such as the amount of suspended solids and the target level of fluid cleanliness. We’ll have someone send you a direct e-mail in order to learn more about your needs.